Wynn Las Vegas, one of the tallest buildings in Las Vegas, opened in April of 2005. The 215-acre site was the former home of the legendary Desert Inn Hotel and the Wynn builds on that tradition while adding modern touches, such as high-speed Internet connections and VOIP technology, in all of the guest rooms. The luxury, 2716-room resort, named for hotel owner Steve Wynn, has quickly become the most popular resort on the Las Vegas Strip. 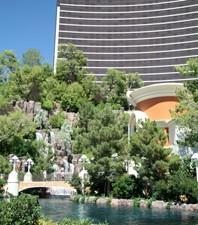 Wynn Las Vegas boasts 2716 guest rooms and suites. All accommodations offer flat-screen LCD television sets, fax machines, high-speed Internet access, and cordless telephones. In addition, all rooms have luxury soaking tubs, separate glassed-in showers, dual sinks, and floor-to-ceiling windows. Many of the rooms offer sweeping views of the Strip or the manicured garden and golf course. The Wynn's suite accommodations range from 640 to 1950 square feet. The largest suites offer a separate living room, a wet bar, a conference room with a table that seats 10, and original artwork from the celebrated Wynn Collection. Facilities at Wynn Las Vegas include a luxury spa and salon offering a variety of beauty and health treatments, a luxury pool and cabana area, a 223,000-square foot convention center, and a championship 18-hole golf course and country club. The retail arcade at the resort includes some of the world's most luxurious names, such as Dior, Cartier, Chanel, Manolo Blahnik, and Judith Leiber. There's also a Ferrari dealership within the resort - the stuff of which dreams are made. Entertainment at Wynn Las Vegas includes the spectacular La Reve, a multi-media live theater presentation that combines ballet, aquatics, gymnastics, and dance; three nightclubs including the "hip" Lure; and "Avenue Q," a popular musical, straight from Broadway. The 111,000-square foot casino at the Wynn features all the latest in gaming technology. The 1900 slot machines range in denomination from 1 cent to $5000 and include video poker and bingo games. The casino offers poker with twice weekly no limit Texas Hold 'Em tournaments. The table games include all of the favorites: Blackjack, Roulette, Pai Gow Poker, and Craps. There's also a large race and sports book. Alex - The Wynn's fine dining restaurant, Alex, is the recipient of AAA's five-diamond award. Alex is open for dinner Tuesday through Sunday. Specialties include a mixture of seafood and meat dishes, all making use of the freshest ingredients. The restaurant also offers a four-course chef tasting menu nightly. SW Steakhouse - Located along the banks of the resort's scenic lake, SW Steakhouse served USDA Prime Black Angus steaks and quality seafood accompanied by traditional salads and side dishes. It's open daily for dinner. Daniel Boulud Brasserie - The Brasserie offers traditional French bistro cuisine in a relaxed atmosphere. Menu favorites include steak frites (a NY strip steak with thin fries), duck confit, and baked halibut. A choice of prix fixe menus is also available. The Brasserie is open for dinner nightly. Okada - Okada combines traditional Japanese cuisine with American produce and ingredients. The casually-elegant restaurant is open nightly for dinner. Menu highlights include a caviar tasting, tempura, and robatayaki (skewers of marinated meat, vegetables, or seafood grilled over Japanese charcoal). With all it has to offer, you just might want the Wynn for your next Las Vegas trip.